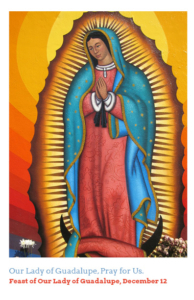 On the feast of Our Lady of Guadalupe, pray and advocate for and with all who migrate. 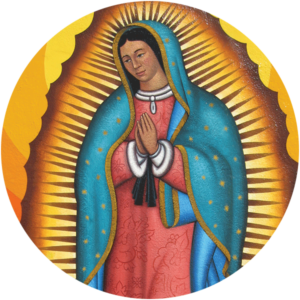 In December of 1531, the Virgin Mary appeared to Juan Diego, an indigenous Mexican farmer, a sign of solidarity with the humble, vulnerable, and oppressed. 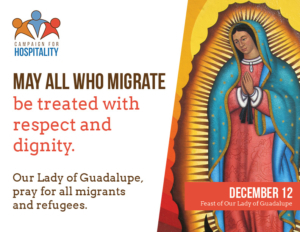 Our Lady of Guadalupe shows us how we might extend hospitality to immigrants and refugees fleeing war, poverty, and persecution to work to fulfill the basic needs of themselves and their families in hopes of finding a future of safety, security, and dignity. 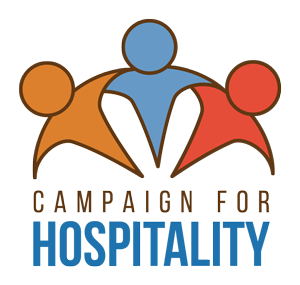 During Advent, we recall that the Holy Family’s story is rooted in their experience as travelers Bethlehem and as refugees—fleeing to Egypt to ensure the safety of the baby Jesus. 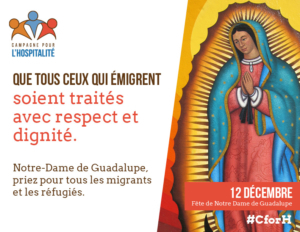 On December 12, we invite you to join the Ignatian network in prayer and solidarity with and for those who migrate. 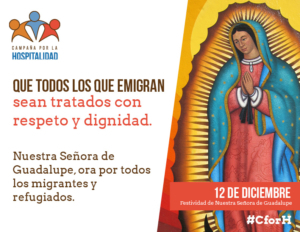 Social Media Sign Post a photo of yourself with this sign on December 12 using #CforH to show your support for migrants and refugees. Prayer Card The half-sheet prayer cards feature the Our Lady of Guadalupe icon and a feast day prayer on the back.